I’ve come to a place in my life where I realize how precious time is. I wish I had more of it. I wish I hadn’t wasted so much time in my youth on… being young. Wandering aimlessly. Thinking about various paths to take with my life and not committing to anything in particular besides living. It is, at times, difficult to avoid overwhelming myself with big questions and demands. “Why didn’t you just go for it?” my brave self says. “Why did you go for it?” my careful self says. Honestly, how do we not tear ourselves to shreds everyday? Damn you, self-reflection. Though, I know time is never really wasted. Not really. One of the self-preservation guidelines I have acquired over my 34 years is to live life without regret. No regret for my actions or inactions. Think carefully, but not too carefully. Pick your battles, but don’t let yourself be pushed around. Cut your losses when you need to, but stand firm at other times. Focus your energy on what makes you feel good and productive. As a youth, people generally terrified me. The amount of times I wish I’d said/did something but didn’t is uncountable and I lived with the regret of it. I lived with it… until I didn’t. There was a moment in my life where I understood that regret is the most wasteful emotion in existence. Ain’t nobody got time for that. I’m a little embarrassed to admit this, but it was actually after watching Brokeback Mountain that I decided to kick regret out of my life. I literally cried for two weeks- everyday, all day -after watching that film. It is a story of a character’s lifelong regret and it gave a very brutal, very lonely idea of what it took from him. It destroyed me. I felt like I was mourning the loss of time. All the time that I had dwelled on things that didn’t help me or hadn’t made the best of a situation. Why had I let my insecurities ever get the best of me? Why have I let my fears take control? I have a body and a mind. Use them! Go! Do! Be! I cried and cried and when I finished crying, I was done and have been ever since. Luckily, regret is just a state of mind. I still do dumb things, but just don’t regret them. Instead, I learn from them and take notes on how do it better next time. I suppose time has had a hand in that. I greatly enjoy wrapped things as well as the act of wrapping things. Wrapped things contain presents, surprises to discover. I take any opportunity to wrap things, especially food. 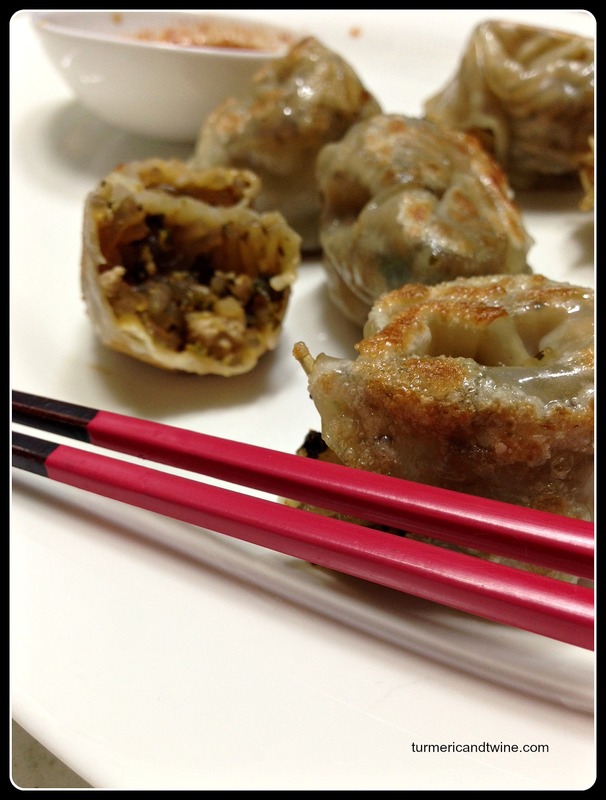 Mandu, or dumplings, are so fun. 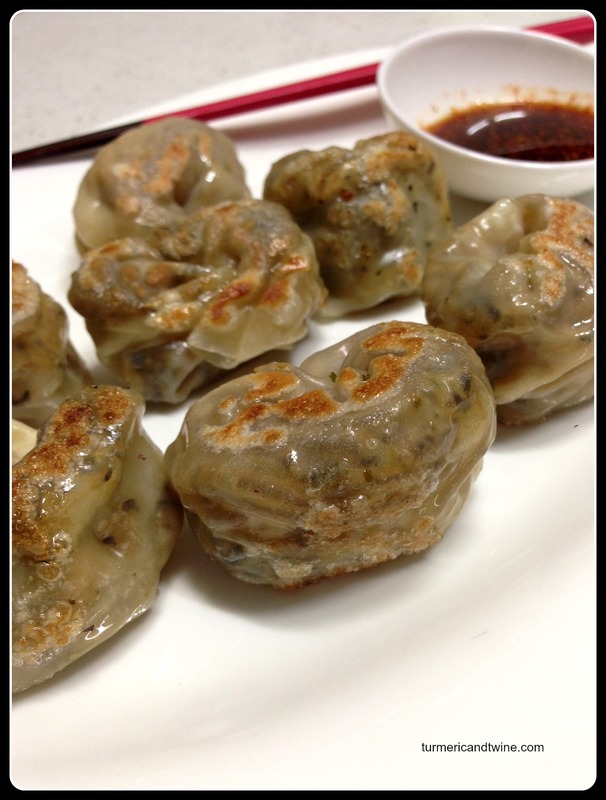 I bought some mandu wraps recently and gave my first attempt at making those mini pockets of delight. I often see Mandu Masters working their magic on each specimen, making them perfectly uniform every time and with incredible speed and efficiency. I bow down to these masters. It is challenging to prevent the mandu from looking like deformed ears. It is fun to eat the ones you mess up. You can fill your mandu with pretty much whatever you want, as long as it is viscous enough. 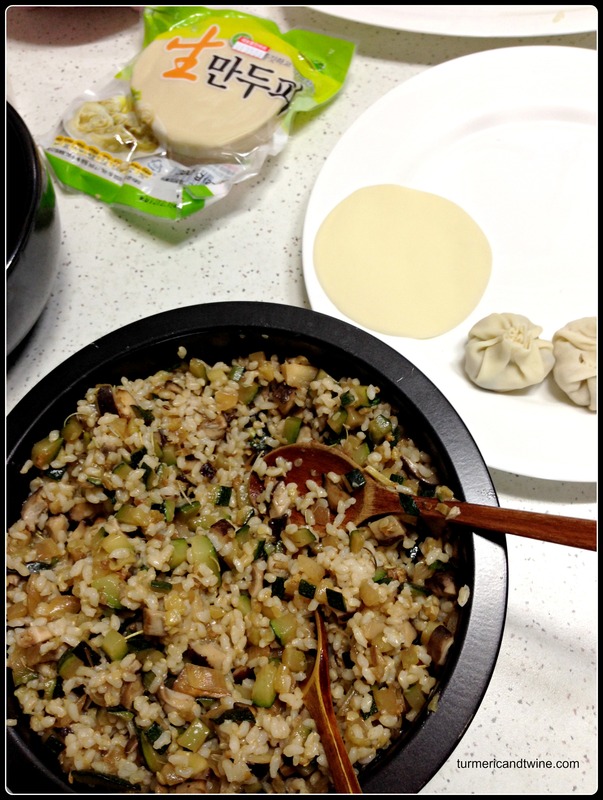 Mandu wraps can be found in the refrigerator section of just about any market or supermarket in Korea. If you do not reside in Korea/Asia nor have a market that provides these wraps, they can be made easily with a little flour and water. I may try a more traditional filling recipe someday, but for now, experimenting is too much fun. Here is the recipe I made most recently. Heat a stovetop fry pan and pour in a dash of cooking oil over medium high heat. Cook the chopped garlic, chilies and onions for a few minutes until translucent and slightly brown. Then, add the chopped celery. Cook until the celery is tender. Once cooled, blend this mixture until viscous. Set aside in a bowl. If using rice noodles or any longer noodles, be sure to break or cut them before adding to the filling mixture. This is to prevent difficulty in closing up the mandu properly. If using rice, simply add to the mixture. Heat your stovetop pan once again with oil on medium high heat. Crumble the tofu by hand directly into the pan and cook for 5-10 minutes or until slightly brown. Add the tofu to the rest of the filling mixture along with the salt. Mix. Prepare a steamer with water and heat until boiling. Now for the fun part: filling the wraps. Place a heaping teaspoon of filling into the center of each wrap. Fold one side over and roll the wrap into a log shape. Pinch the ends closed and wrap them around until they touch on one side. Wet your fingers and pinch together until closed. Place them in the steamer and steam for 7-10 minutes. Your mandu can be eaten at this stage, but I highly recommend a further step of a light pan-frying. This makes your mandu extra delicious. Simply, heat a little oil in a pan and fry the mandu on each side for about 2-3 minutes. For the sauce, my method is fool proof and delicious: one part soy sauce, one part white or apple cider vinegar and a pinch of chili powder. 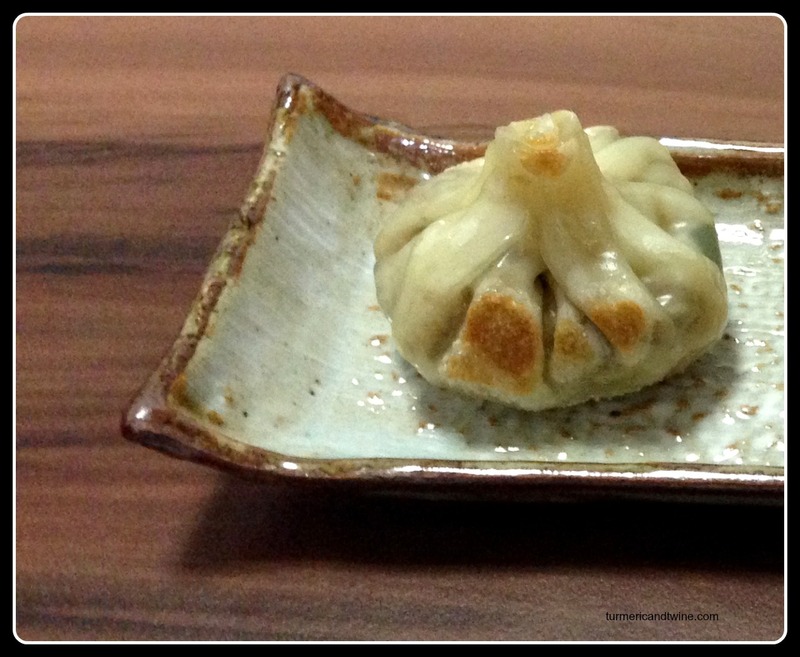 Dip your lopsided, ear-shaped mandu lovingly into the sauce. Laugh about how each one will help you hear better and devour ruthlessly. yum, darling. And great writing, too. You are a light!